In early August, CSF held our first Training of Trainers (ToT) course in Bali, Indonesia. Since we launched our programs in Indonesia in 2015, demand for CSF’s unique approach to training and capacity building has been increasing. In response, we are working to build a pool of Indonesian instructors to help us meet the demand for more training on the national, subnational, and local levels, to ultimately help stakeholders use economics to effectively and sustainably manage marine resources. We received applications for the TOT from experts at universities, NGOs, private institutions, and the government, all of whom work within the field of marine economics. We selected 20 participants best suited to benefit from the training and whose qualifications were compatible with the qualities we look for in CSF instructors. The 5-day training was led by four of CSF’s top instructors, including Luky Adrianto from Bogor Agricultural University, John Lynham from the University of Hawai’i-Manoa, David Johnson from University of Wisconsin-Madison, and Kim Bonine, CSF’s Training Director. The instructors covered a wide-range of topics related to fisheries economics such as fisheries policy, governance and institutions, microeconomics, cost-benefit analysis, as well as pedagogy and teaching approaches. The training also provided an opportunity for each participant to deliver a teaching demonstration, using techniques learned during the training. Course participants playing the harvest game which illustrates the concept of the Prisoner's Dilemma. Participants were also introduced to CSF’s signature experimental games: the negotiation game, potato game, and harvest game. These games offer an interactive and fun way to demonstrate the concepts we teach in lectures. The TOT participants noted that this was their first time to see economic concepts presented through games and interactive exercises. Participants trading potatoes in a game which simulates a real life marketplace. 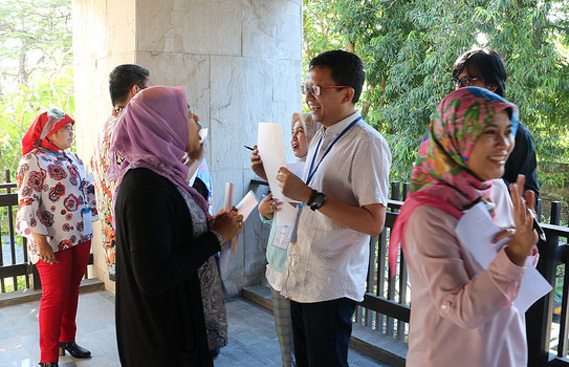 At the end of the TOT, participants remarked how much their perspective on teaching had changed, especially on topics as complex as fisheries economics. Fedi Sondita, a senior lecturer from Bogor Agricultural University, shared that he used to have problems explaining fisheries management and economics to his students in a simple way. “The training was an eye-opener and a breath of fresh air for lecturer like me. But more importantly, CSF has taught me techniques to gain students’ attention in class.” Making economics sound fun is no easy task, a notion supported by Mia Amalia who works in the National Development Planning Agency of the Republic of Indonesia. “I used to cram all the information into PowerPoint presentations and have 50+ slides to explain to people in a two-hour period, which was really not effective,” she commented. She said she could not wait to implement the CSF way of teaching. “I think even adults will appreciate the chance to play a game during a session. There will always be a kid inside of us,” she added. Working with cartoon fish to understand carrying capacity in a fishery. We look forward to engaging further with this new pool of instructors at both the participants’ institutions and at future CSF trainings in Indonesia. This work was made possible with generous funding from the John D. and Catherine T. MacArthur Foundation.